This article presents a detailed protocol for T4 ligation and denaturing PAGE purification of small circular DNA molecules, annealing and native PAGE analysis of circular tiles, assembling and AFM imaging of 1D and 2D DNA nanostructures, as well as agarose gel electrophoresis and centrifugation purification of finite DNA nanostructures. Guo, X., Wang, X. M., Xiao, S. J. Stable DNA Motifs, 1D and 2D Nanostructures Constructed from Small Circular DNA Molecules. J. Vis. Exp. (146), e58744, doi:10.3791/58744 (2019). This article presents a detailed protocol for synthesis of small circular DNA molecules, annealing of circular DNA motifs, and construction of 1D and 2D DNA nanostructures. Over decades, the rapid development of DNA nanotechnology is attributed to the use of linear DNAs as the source materials. For example, the DAO (double crossover, antiparallel, odd half-turns) tile is well-known as a building block for construction of 2D DNA lattices; the core structure of DAO is made from two linear single-stranded (ss) oligonucleotides, like two ropes making a right hand granny knot. Herein, a new type of DNA tiles called cDAO (coupled DAO) are built using a small circular ss-DNA of c64nt or c84nt (circular 64 or 84 nucleotides) as the scaffold strand and several linear ss-DNAs as the staple strands. Perfect 1D and 2D nanostructures are assembled from cDAO tiles: infinite nanowires, nanospirals, nanotubes, nanoribbons; and finite nano-rectangles. Detailed protocols are described: 1) preparation by T4 ligase and purification by denaturing PAGE (polyacrylamide gel electrophoresis) of small circular oligonucleotides, 2) annealing of stable circular tiles, followed by native PAGE analysis, 3) assembling of infinite 1D nanowires, nanorings, nanospirals, infinite 2D lattices of nanotubes and nanoribbons, and finite 2D nano-rectangles, followed by AFM (Atomic Force Microscopy) imaging. The method is simple, robust, and affordable for most labs. DNA molecules have been used to build many kinds of nanostructures over decades. Typical motifs include DAE (double crossover, antiparallel, even half-turns) and DAO tiles1,2,3, star tiles4,5,6,7, single stranded (ss) tiles8,9,10, and DNA origami11,12,13. These DNA motifs and lattices are assembled from linear ss-DNAs. Recently, others and we have reported the use of circular ss-oligonucleotides as scaffolds to build motifs, 1D nanotubes, and 2D lattices14,15,16,17. By inserting a Holliday junction (HJ)18,19,20,21 at the center of c64nt, a pair of two coupled DAO tiles can be formed17. This new cDAO motif and its derivatives are stable and rigid enough to assemble 2D DNA lattices up to 3 × 5 µm2. In this paper, we use a term of "circular tile", which is defined as a stable DNA complex molecule constructed with one circular scaffold and other linear staples of ss-oligonucleotides, and another term of "linear tile", which is built from a full set of linear ss-oligonucleotides. This protocol demonstrates how to construct five kinds of DNA nanostructures with small circular DNA molecules as scaffolds: 1) infinite 1D c64nt and c84nt nanowires, 2) infinite 2D cDAO-c64nt-O and cDAO-c64nt-E (-O represents an odd number of 5 half-turns and -E represents an even number of 4 half-turns) lattices, 3) infinite 2D cDAO-c84nt-O and cDAO-c84nt-E lattices, 4) finite 2D 5 × 6 cDAO-c64nt-O and 5 × 6 cDAO-c74&84nt-O rectangles, 5) infinite 1D acDAO-c64nt-E nanorings and nanospirals (please refer to Figure 3-5 for the schematic drawings and images of the above five kinds of DNA nanostructures). The 1D c64nt and c84nt nanowires are assembled from each c64nt and c84nt scaffold associated with two linear staples respectively. Each circular tile of cDAO-c64nt, acDAO-c64nt, cDAO-c74nt, or cDAO-c84nt is annealed from its corresponding scaffold of c64nt, c74nt, or c84nt with four linear staples respectively. The infinite 2D lattices are assembled from the same type of two circular tiles with different sequences. The two finite 2D rectangle lattices are assembled from two sets of 32 circular sub-tiles respectively. To save money, only one-sequenced c64nt, c74nt, and c84nt is used as the respective scaffold while different overhangs are used to anneal the 32 cDAO-c64nt, 12 cDAO-c74nt, and 20 cDAO-c84nt circular sub-tiles respectively in the first sub-tile annealing step, then mix the corresponding 32 circular sub-tiles together and apply the second lattice annealing step to assemble the finite 5 × 6 cDAO-c64nt-O and 5 × 6 cDAO-c74&84nt-O lattices, respectively. Definitely, differently-sequenced circular scaffolds can be adopted to assemble a variety of finite size nanostructures, however it will cost more money and labors. The infinite 1D acDAO-c64nt-E nanorings and nanospirals are annealed from one-sequenced asymmetric acDAO-c64nt tiles with linear connections of an even number of 4 half-turns. There are two approaches to assemble infinite 2D lattices from circular tiles of cDAO-c64nt and cDAO-c84nt, which are distinguished by the intertile distances of an even number of 4 and an odd number of 5 half-turns respectively. The former requires all tiles to be aligned identically; the latter requires alternation of the faces of two neighboring tiles along the helical axes. If the tile is rigid and planar, such as cDAO-c64nt, both approaches will generate planar nanoribbons; if the tile is curved towards one direction, such as cDAO-c84nt, the intertile connection of an even number of 4 half turns will generate nanotubes, whereas the intertile connection of an odd number of 5 half turns will produce planar nanoribbons due to elimination of curvature-biased growth by alternate alignment of curved tiles. The successful assembly of 1D and 2D DNA nanostructures from circular tiles indicates several advantages of this new approach: enforced stability and rigidity of circular tiles over linear tiles, chiral tiles for assembly of asymmetrical nanostructures such as nanorings and nanoribbons, new visions on understanding the DNA mechanics and molecular structures, etc. Use all linear DNAs provided by commercial companies directly without further purification. Centrifuge the DNA samples at 5,000 × g for 5 min to collect all DNA pellets at the bottom of the tubes. Add an appropriate volume of TE buffer (10 mM Tris, 1 mM EDTA, pH 8.0) to dissolve the DNA. Measure the concentration of "a" ng/µL for each ss-DNA solution using a micro UV spectrometer at 260 nm. Convert "a" ng/µL to "b" µM following b = a × 103 / (molecular weight of the DNA strand). Adjust the amount of TE solution to make a 10 µM DNA stock solution. Use T4 DNA ligase to connect the 3' and 5' ends of 5'-phosphorylated linear DNA templates ( Figure 1) of c64nt, c74nt and c84nt provided from commercial companies directly. Mix the 5'-phosphorylated linear DNA strand (3.5 µM) and its corresponding splint DNA strand (4.5 µM) in 80 µL TE buffer in a 200 µL PCR test tube15. Incubate the tube in an open thermo bottle filled with 95 °C water. Cool down the hot water to room temperature (25 °C) for about 2-3 hours under the lab atmosphere. Add 10 µL of 10x T4 buffer (660 mM Tris-HCl, 66 mM MgCl2, 100 mM DTT, 1 mM ATP) and 10 µL of T4 ligase (300 U/µL) to the mixture to a final volume of 100 µL. Incubate the mixture in a thermocycler for 16 hours at 16 °C. NOTE: The above DNA concentrations and reaction volume of ~100 µL are optimized for the high ligation efficiency and the high yield of correct oligo-monomer cyclization. Run two or more tubes of ligation reactions in the same time according to the experimental design. An alternative incubation procedure for ligation replacing step 1.6 is 4 hours at 25 °C. After the incubation, inactivate the T4 ligase in 95 °C water for 5 minminutes. Then transfer the tube to an ice water bath and incubate for 5 minutes to cool down. Add 10 µL of 10x Exonuclease I buffer and 10 µL of Exonuclease I (5 U/µL) to the quenched mixture and incubate the tube at 37 °C in a water bath for 30 min to selectively digest the remaining linear DNAs and leave the circularized DNAs intact. Prepare a 10% denaturing PAGE gel. Wear rubber gloves and goggles when preparing the PAGE gel in the fume hood. Add 6.67 mL of 30% (w/v) acrylamide/bisacrylamide solution (19:1), 2 mL of 10x TAE·Mg buffer (40 mM Tris, 40 mM HAc, 1 mM EDTA, pH 8.0 ,12.5 mM Mg(Ac)2), 8.4 g of urea (7 M) and deionized water to a final volume of 20 mL in a 40 mL centrifuge tube. ​Caution: The 30% (w/v) acrylamide/bisacrylamide solution (19:1) solution is toxic. Add 20 µL of tetramethylethylenediamine (TEMED) and 100 µL of ammonium persulfate (APS, 10% w/v) to the 40 mL tube before transfer the gel solution to the electrophoresis system immediately. Insert a 1.5 mm thick and 10-well comb. Wait at least 20 min until the gel solution is solidified. Set a constant voltage of 80 V for a gel of 85 × 80 × 1.5 mm3 (width × height × thickness). Add 1x TAE·Mg buffer to the electrophoresis system and prerun the gel for 20 min at 10 V/cm. Put the PCR test tube from step 1.8 in 95 °C water for 5 min to inactivate Exonuclease I. Then transfer the tube to an ice water bath and incubate for another 5 min. Add 20 µL of formamide in the tube to a final volume of 140 µL and mix the solution. Distribute the solution to 7-9 denaturing PAGE gel wells equally with 16-20 µL for each gel well. Mix 2 µL of loading dye (0.05% bromophenol blue, 0.05% xylene cyanol FF, 60% glycerol, 10 mM Tris-HCl, 60 mM EDTA, pH 7.6) with 8 µL of the corresponding precursor linear DNA (10 µM) and inject the mixture to a separate well for reference. NOTE: The addition of formamide is to increase the density of the loading solution for sinking to the bottom of the PAGE gel well and also to disassociate some double stranded DNA residues. Run the gel for about 2 h at 10 V/cm and stop running when xylene cyanol FF is at the 2/3 position of the glass plate with the naked eye. Wear rubber gloves and goggles to protect skins and eyes. Take the gel out of the glass plate. Place the gel on a fluorescent TLC (thin layer chromatography) plate. Cut off the target gel bands by a razor blade as exactly as shadowed by UV irradiation (Figure 2). Caution: The UV light is harmful to eyes and skins. NOTE: Under UV irradiation at 254 nm, DNA will absorb the light and cast a shadow onto the TLC plate. 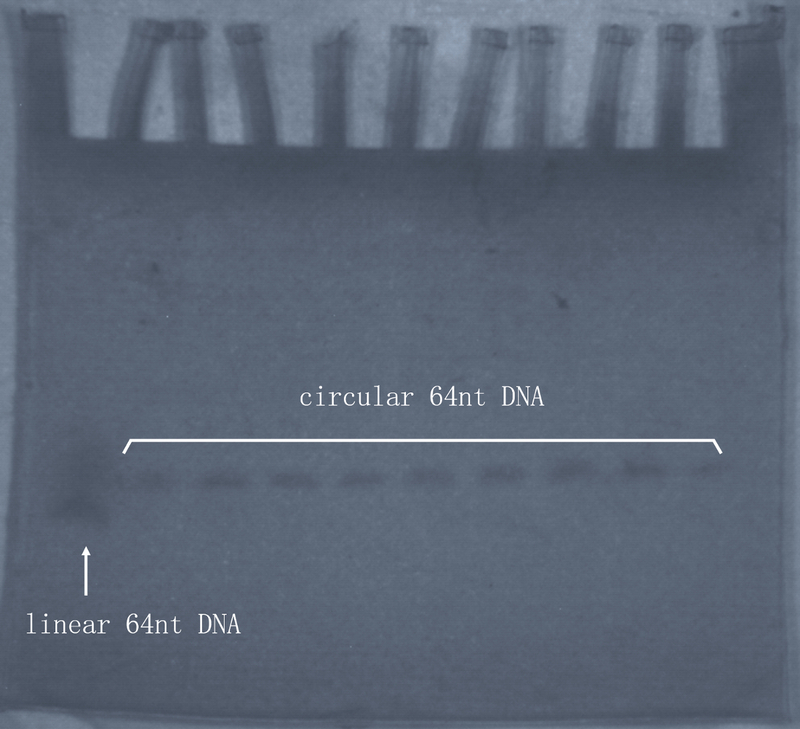 The circular DNA ran slightly slower than its corresponding precursor linear DNA. Some undigested linear DNAs and unwanted circular DNAs in small amounts which surround the shadowed target band will pollute the circular DNA if they are collected. Transfer the gel bands into a 2.0 mL microcentrifuge tube. Air dry or blow dry the gel bands and then mash the gels into a paste by a spatula or flattened glass rod. Make sure the gel has been completely crushed into a paste, which is critical to the high yield of circular DNA. Add twice of the gel volume deionized water into the tube and shake the tube at room temperature overnight. Filter the mixture to collect the supernatants in a 2.0 mL microcentrifuge tube. Recover any residual DNA by rinsing with small volume of deionized water and filter again to combine the supernatants. Extract the eluent with equal volume of n-butanol. Repeat this procedure until the aqueous volume is reduced to about 200 µL. Add 500 µL of absolute ethanol (−20 °C) and 20 µL of 3 M NaOAc (pH 5.1) to the mixture for DNA precipitation. Store the tube at −20 °C for 30 min. Centrifuge the tube at 12,000 × g for 10 min at 4 °C, discard the supernatant. The remaining DNA precipitate is about 100 µL in the tube. Add 600 µL of 75% ethanol (−20 °C) to the tube and store it at −20 °C for 30 min. Then centrifuge at 12,000 × g for 10 min at 4 °C, discard the supernatant. The remaining DNA precipitate is about 100 µL solution in the tube again. Repeat the procedure twice. After the last centrifugation, discard the supernatant as much as possible. Dry the remains with a vacuum concentrator. Store the purified circular DNA in the tube at −20 °C. Resuspend the circular DNA in TE buffer to make a 10 µM circular DNA stock solution according to step 1.3 when needed. Prepare each tile or nanostructural assembly solution of c64bp, c84bp, HJ-c64nt, aHJ-c64nt, HJ-c84nt, tHJ-c84nt, cDAO-c64nt, acDAO-c64nt, cDAO-c84nt, c64nt, c84nt, and acDAO-c64nt-E with a designed set of linear and circular DNAs for one-pot annealing. For each assembly solution, mix 2 µL of 10x TAE·Mg buffer, 1 µL of each DNA stock solution of a set of linear and circular strands in equal molar ratios, and additional TE buffer in a 200 µL PCR test tube to a final concentration of each strand at 0.5 µM and a final volume of 20 µL. Anneal the assembly solution in a thermo bottle from 95 °C to 25 °C over 48 h.
Prepare each assembly solution of 2D infinite lattices of cDAO-c64nt-E, cDAO-c64nt-O, cDAO-c84nt-E, and cDAO-c84nt-O with a designed set of linear and circular DNAs for two-step annealing. Prepare each precursor sub-tile assembly solution by mixing 2 µL of 10x TAE·Mg buffer, 1 µL of each DNA stock solution of a set of linear and circular strands in equal molar ratios, and additional TE buffer in a 200 µL PCR test tube to a final concentration of 0.5 µM for each strand and a final volume of 20 µL. In the first sub-tile annealing step, anneal each precursor sub-tile solution in a PCR thermocycler using a fast-linear cooling method from 95 °C to 25 °C over 2.5 h.
Prepare each assembly solution of the above four infinite lattices by mixing 10 µL of each of the two corresponding sub-tile solutions together to a final concentration of 0.25 µM for each strand. In the second lattice annealing step, anneal the 20 µL mixture in a PCR thermocycler using a slow cooling method of staying at 50 °C for 2 h and cooling down at a rate of 0.1 °C per 5 minutes to 20 °C, about 24 h in total. NOTE: Two parallel experiments can be run simultaneously or subsequently in the second annealing step for each 2D infinite lattice. Prepare assembly solutions of two finite rectangle assemblies of 5 × 6 cDAO-c64nt-O and 5 × 6 cDAO-c74&c84nt-O for two-step annealing. Prepare each precursor sub-tile assembly solution by mixing 1 µL of 10x TAE·Mg buffer, 0.5 µL of each DNA stock solution of a set of linear and circular strands in equal molar ratios, and additional TE buffer in a 200 µL PCR test tube to a final concentration of 0.5 µM for each strand and a final volume of 10 µL. In the first annealing step, anneal each precursor sub-tile solution in a PCR thermocycler using a fast-linear cooling method from 95 °C to 25 °C over 2.5 h.
Prepare each finite rectangle lattice assembly solution by mixing 32 x (2 µL of each sub-tile solution) together in a 200 µL PCR test tube to a final concentration of ~15 nM for each sub-tile and a final volume of 64 µL. In the second annealing step, anneal the 64 µL mixture in a PCR thermocycler using a slow cooling method of staying at 50 °C for 2 h and cooling down at a rate of 0.1 °C per 5 min to 20 °C, about 24 hours in total. NOTE: Five parallel experiments can be run simultaneously or subsequently in the second annealing step for each finite rectangle assembly. Prepare a 10% native PAGE following step 1.9 except for the urea component. For control samples of c64bp and c84bp, add 2 µL of each assembly solution and 1 µL of loading dye to 3 µL of TE buffer as controls separately. For each of other assemblies listed in Figure 3, add 1 µL of each assembly solution and 1 µL of loading dye to 4 µL of TE buffer. Inject each of the above solutions to a gel well. Add 5 µL of DNA marker (25-500 bp) to a separate well for reference. Run the gel for about 4 hours at 10 V/cm in an ice water bath. The xylene cyanol FF will run out of the glass plate. Wear rubber gloves and goggles to protect skins and eyes. Take the gel out of the glass plate and immerse it in 100 mL of deionized water with 10 µL of a nucleic acid gel stain for 30 min. Caution: The nucleic acid gel stain solution is toxic. Observe the gel under an UV imaging system and take a picture of the stained gel (Figure 3). Prepare a native 2% agarose gel for electrophoresis purification of finite lattices. Mix 1 g of agarose powder, 5 mL of 10x TBE·Mg buffer (89 mM Tris, 89 mM Boric Acid, 2 mM EDTA, pH 8.0, 12.5 mM Mg(Ac)2), 2 µL of nucleic acid gel stain and 47.5 mL of deionized water in a 250 mL triangle bottle. Boil the mixture until the bubbles become small and dense. Add hot water in the bottle to a total volume of 50 mL and a concentration of 2% agarose. Wear thick gloves. Pour the gel solution into a plastic gel box of 7 x 10 x 1 cm3 (width × length × thickness). Insert a 1.5 mm thick and 12-well gel comb. Wait for the gel to cool down to room temperature. If necessary, put the gel in a 4 °C fridge. Caution: Be aware of scalding because the solution is very hot. Add 0.5x TBE·Mg buffer in the electrophoresis system. Prerun the gel at 5 V/cm for 20 min in an ice water bath at a constant voltage of 50 V.
Inject 20 µL of the finite lattice solution prepared in step 2.3 in each agarose gel well and add 5 µL of a DNA marker (100-3,000 bp) to a separate well. Run the gel for 2 h at 5 V/cm in an ice water bath. Wear rubber gloves and goggles to protect skins and eyes. Cut the target gel bands with a position similar to the 1,000 bp marker under UV light and slice them into fine pieces and place the crushed gels into a filter column8. Centrifuge the column at 2,000 x g for 5 min at 4 °C. Extract the sample solution through the column. Collect the solution for AFM imaging. Purify finite lattices by PEG precipitation. Mix 50 µL of the finite lattice solution prepared in step 2.3 with an equal volume of 15% PEG8000 (w/v) buffer (20 mM Mg(Ac)2, 5 mM Tris, 1 mM EDTA and 505 mM NaCl)22. Centrifuge the solution at 18,000 × g at 4 °C for 30 min. Remove the supernatant and add 100 µL of PEG buffer. Repeat the centrifugation. After removing the supernatant, dissolve the pellet in 1x TAE·Mg buffer for AFM imaging. NOTE: Purification is necessary for the finite lattices of 5 × 6 cDAO-c64nt-O and 5 × 6 cDAO-c74&c84nt-O for AFM imaging and other applications. If the yield is too low, increase the centrifugation speed. If the product is not pure enough, repeat step 4.2.2. For c64nt nanowire, c84nt nanowire, acDAO-c64nt-E, infinite 2D lattices of cDAO-c64nt-E(O), and cDAO-c84nt-E(O), deposit 2 μL of annealed sample on a freshly cleaved mica surface. Leave for 2 min for adsorption of DNA lattices to the mica surface. Wash the surface with 100 µL of deionized water twice and dry it by compressed air. Obtain AFM images of infinite DNA lattices in air by scanning the mica surface with triangular AFM probes under tapping mode. Set the following parameters for scanning: scan size of 0.5~5 µm, scan resolution of 512 lines, and scan rate of 3.5 Hz (Figure 4). For finite DNA lattices of 5 × 6 cDAO-c64nt-O and 5 × 6 cDAO-c74&c84nt-O, deposit 80 µL of 1x TAE·Mg buffer on a freshly cleaved mica surface. Then add 5 µL of finite samples into the buffer. Leave for 2 min for adsorption of DNA lattices to the mica surface. Add another 50 µL of 1x TAE·Mg buffer on the AFM probe. Obtain AFM images of finite DNA lattices in fluid by scanning the mica surface with triangular AFM probes under tapping mode. Set the following parameters for scanning: scan size of 0.5-1 µm, scan resolution of 256 lines, and scan rate of 1.5 Hz (Figure 5). The circular DNA moves slightly slower than its precursor linear DNA in denaturing PAGE (Figure 2) because the pore inside the circular DNA is penetrated and retarded by gel fibers23,24,25. The correct ligation reaction efficiency for oligo-monomer cyclization depends on the substrate sequence and concentration, reaction temperature, time, etc. As the concentration of a precursor linear DNA is high enough at around 3.5 µM, the cyclization products of c64nt (or c84nt) and the precursor reference in this protocol can be directly shadowed as bands in the TLC plate under UV light without dying. If the bands of circular DNA are vague or invisible, indicating a failure of the ligation reaction or a much low product yield. Sometimes there are two bands above the linear precursor band, referring an additional oligo-dimer ring except for the correct oligo-monomer ring. Just leave the higher bands alone and collect the lower ones. The purified circular DNA products can be seen as white powder in the tube after vacuum drying. Except for the denaturing PAGE, the DNA purity can also be measured by UV spectrometer. The absorption peak of DNA is at 260 nm. Two standard criteria for the DNA purity are the absorption ratio of 280 nm/260 nm at 1.8 and that of 280 nm/230 nm commonly in the range of 2.0-2.2. If the above two ratios deviate from the standard values, the remains should be extracted again by following steps 1.18-1.20. The yields of c64nt and c84nt for the correct oligo-monomer cyclization are measured at the range of 30-60% according to this protocol. Native PAGE analysis provides a lot of information about the motif's stability, purity, rigidity, assembly mode of monomer or polymer, etc (Figure 3). The c64nt assembly families of c64bp, HJ-c64nt, aHJ-c64nt, cDAO-c64nt, and acDAO-c64nt have only one clear and clean band for each assembly, representing they are stable monomer motifs. While the c84nt assembly families of HJ-c84nt, tHJ-c84nt, and cDAO-c84nt tiles have smears around their main bands, indicating minor by-products except for the target monomer motifs. Regardless of the minor byproducts of incorrect associates, excellent cDAO-c84nt-O (E) lattices with high yields can be assembled. To get a clear and clean electrophoresis image, the loading volume should be no more than 10 µL and the quantity of DNA should be 0.01~0.02 µg/mL. The success of experiments is finally evaluated by 1D and 2D DNA nanostructures imaged by AFM (Figure 4 and Figure 5). Each assembly has its own morphological features in the micrometer scale such as nanowires, nanotubes, nanospirals, nanoribbons, etc. Moreover, the detailed textures of the DNA assemblies in the nanometer scale correlated to their theoretical circular tile sizes and organization modes very well respectively are the key for verification of successful and correct assembly. Therefore, both panoramic and high-resolution AFM images in micrometer and nanometer scales must be obtained. Choices of AFM methods and probes are crucial for the high-quality AFM images. The scan force should be adjusted as small as 50 pN26. If the scan force is too big, it would damage the DNA nanostructural patterns. The environmental cleanliness is another key parameter to get a clean and beautiful high-resolution AFM image in fluid. All buffers must be filtered by 0.22 µm filter; the probe holder and tweezers must be washed by detergent and rinsed by deionized water. If the environment is polluted by particulate debris, the probe tip would be damaged or clung by particles in the buffer, thus affecting the quality of AFM images. Figure 1. Synthesis of circular DNA. The flow diagram represents how a long 5'-phosphorylated linear oligonucleotide in blue evolves to a circular DNA molecule. The two short red strands represent the splint oligonucleotides. Please click here to view a larger version of this figure. Figure 2. Denaturing PAGE photograph of DNA cyclization products under UV light without dying. A precursor linear 64nt DNA band is in the far-left lane and its cyclization products of circular 64nt (c64nt) DNA appear as 9 bands at the same horizontal level in other 9 lanes. The 9 bands of c64nt will be cut off for abstracting circular DNAs. Please click here to view a larger version of this figure. Figure 3. Native PAGE photographs after dying and schematic double-helical models of circular tiles. Both polymers of c64nt nanowire and c84nt nanowire are represented by their simplest folding unit cells, in which the two aligned dots above and below each unit cell indicate the infinite alignment of unit cells vertically up and down, with equal distances between duplexes to form nanowires. Monomer circular tiles of c64bp, c84bp, HJ-c64nt, aHJ-c64nt, HJ-c84nt, and tHJ-c84nt in A) have no protruding overhangs out of their rings, whereas cDAO-c64nt, acDAO-c64nt, and cDAO-c84nt in B) have both blunt-ended 10 bp overhangs respectively. For sequences, please refer to the Table of DNA Sequences. This figure has been modified from a previously published figure17. Please click here to view a larger version of this figure. Figure 4. AFM images of typical 1D and 2D infinite DNA assemblies scanned in air. A) c64nt nanowire, B) infinite acDAO-c64nt-E, C) infinite cDAO-c64nt-E, D) infinite cDAO-c64nt-O, E) infinite cDAO-c84nt-E, and F) infinite cDAO-c84nt-O are annealed by sticky end cohesion. All texture details in these AFM images are in line with the tile sizes and organization modes very well. For sequences, please refer to the Table of DNA Sequences. This figure has been modified from a previously published figure17. Please click here to view a larger version of this figure. Figure 5. AFM images of finite rectangle assemblies scanned in fluid. The finite rectangle assembly of A) 5 × 6 cDAO-c64nt-O is composed of 32 cDAO-c64nt sub-tiles, and B) 5 × 6 cDAO-c74&84nt-O is composed of 12 cDAO-c74nt and 20 cDAO-c84nt sub-tiles. For sequences, please refer to the Table of DNA Sequences. This figure has been modified from a previously published figure17. Please click here to view a larger version of this figure. Table of DNA Sequences. Please click here to download this file. The protocols presented in this article focus on the synthesis of small circular DNA molecules and the assembly of DNA nanostructures. Most of randomly-sequenced DNA designs can be used in this protocol. The purity of circular DNAs is critical for the success of DNA assemblies. The production yield of cyclization can be improved by lowering the concentration of 5'-phosphorylated linear DNA; however, this will increase the workload to produce the same amounts of circular DNAs. The length of splint DNA strands also affects the correct ligation reaction, it is optimized to be around 20 nucleotides long for both c64nt and c84nt. An appropriate concentration of magnesium cations (e.g., 12.5 mM) in the solution during and after assembly is very important for the formation and maintenance of DNA nanostructures. Thus, a magnesium cation concentration of 12.5 mM is always kept during the processes of annealing, native PAGE, agarose gel electrophoresis and PEG buffer centrifugation purifications, AFM imaging, etc. 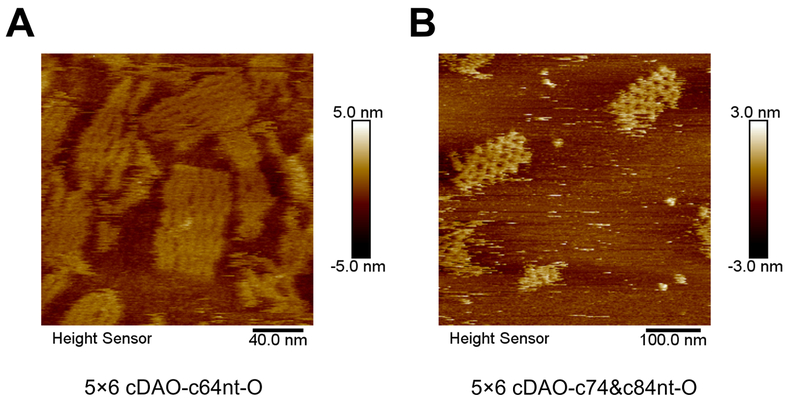 For finite rectangle assemblies of 5 × 6 cDAO-c64nt-O and 5 × 6 cDAO-c74&84nt-O, the agarose gel purification does not affect the texture details, while the PEG buffer centrifugation purification harms the texture details of DNA nanostructures in the high-resolution AFM images. Benefit from the stability and rigidity of circular tiles, it is much easier to produce well-organized and large-size single crystalline 2D lattices from circular modules than from linear tiles and scaffolded origami9,11, although extra work is needed to synthesize and purify the circular DNA molecules. With only one circular DNA as the same core structure, many circular modules can be generated with different overhangs; by means of specific sticky end cohesions of overhangs finite nanostructures can be built; this strategy reduces the workload and cost of finite nanostructures. One significant advantage of circular DNA nanostructures is the resolution of secondary and tertiary structures of DNA molecules and their key elements such as Holliday junction from the texture details of single crystalline lattices. The 1D, 2D and 3D nanostructures built from circular modules and their potential applications in biology, medicine, and nano-engineering will become a new family member of DNA nanotechnology in the future. We are grateful for financial support from the NSFC (grants no. 91753134 and 21571100), and the State Key Laboratory of Bioelectronics of Southeast University. Tsu-Ju, F., Seeman, N. C. DNA double-crossover molecules. Biochemistry. 32, (13), 3211-3220 (1993). Winfree, E., Liu, F., Wenzler, L. A., Seeman, N. C. Design and self-assembly of two-dimensional DNA crystals. Nature. 394, (6693), 539-544 (1998). Liu, F., Sha, R., Seeman, N. C. Modifying the surface features of two-dimensional DNA crystals. Journal of the American Chemical Society. 121, (5), 917-922 (1999). 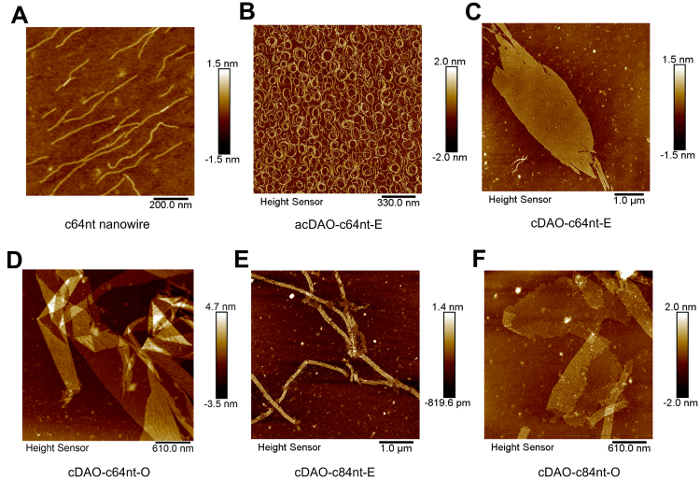 Yan, H., Park, S. H., Finkelstein, G., Reif, J. H., LaBean, T. H. DNA-templated self-assembly of protein arrays and highly conductive nanowires. Science. 301, (5641), 1882-1884 (2003). Liu, D., Wang, M., Deng, Z., Walulu, R., Mao, C. Tensegrity: Construction of rigid DNA triangles with flexible four-arm DNA junctions. Journal of the American Chemical Society. 126, (8), 2324-2325 (2004). Tian, C., Li, X., Liu, Z., Jiang, W., Wang, G., Mao, C. Directed self-assembly of DNA tiles into complex nanocages. Angewandte Chemie: International Edition. 53, (31), 8041-8044 (2014). Wang, P., et al. Retrosynthetic analysis-guided breaking tile symmetry for the assembly of complex DNA nanostructures. Journal of the American Chemical Society. 138, (41), 13579-13585 (2016). Ke, Y., Ong, L. L., Shih, W. M., Yin, P. Three-dimensional structures self-assembled from DNA bricks. Science. 338, (6111), 1177-1183 (2012). Ke, Y., et al. DNA brick crystals with prescribed depths. Nature Chemistry. 6, (11), 994-1002 (2014). Rothemund, P. W. K. Folding DNA to create nanoscale shapes and patterns. Nature. 440, (7082), 297-302 (2006). Douglas, S. M., Dietz, H., Liedl, T., Högberg, B., Graf, F., Shih, W. M. Self-assembly of DNA into nanoscale three-dimensional shapes. Nature. 459, (7245), 414-418 (2009). Ackermann, D., Schmidt, T. L., Hannam, J. S., Purohit, C. S., Heckel, A., Famulok, M. A double-stranded DNA rotaxane. Nature Nanotechnology. 5, (6), 436-442 (2010). Zheng, H., Xiao, M., Yan, Q., Ma, Y., Xiao, S. J. Small circular DNA molecules act as rigid motifs to build DNA nanotubes. Journal of the American Chemical Society. 136, (29), 10194-10197 (2014). Wang, M., Huang, H., Zhang, Z., Xiao, S. J. 2D DNA lattices constructed from two-tile DAE-O systems possessing circular central strands. Nanoscale. 8, (45), 18870-18875 (2016). Guo, X., Wang, X. M., Wei, S., Xiao, S. J. Construction of a holliday junction in small circular DNA molecules for stable motifs and two-dimensional lattices. ChemBioChem. 19, (13), 1379-1385 (2018). Holliday, R. A mechanism for gene conversion in fungi. Genet. Res. 5, (2), 282-304 (1964). Duckett, D. R., et al. The structure of the Holliday junction. Structure and Methods, Human Genome Initiative and DNA Recombination. 1, (1), 157-181 (1990). Ariyoshi, M., Vassylyev, D. G., Iwasaki, H., Nakamura, H., Shinagawa, H., Morikawa, K. Atomic structure of the RuvC resolvase: A holliday junction-specific endonuclease from E. coli. Cell. 78, (6), 1063-1072 (1994). Eichman, B. F., Vargason, J. M., Mooers, B. H., Ho, P. S. The Holliday junction in an inverted repeat DNA sequence: sequence effects on the structure of four-way junctions. Proceedings of the National Academy of Sciences of the United States of America. 97, (8), 3971-3976 (2000). Stahl, E., Martin, T. G., Praetorius, F., Dietz, H. Facile and scalable preparation of pure and dense DNA origami solutions. Angewandte Chemie: International Edition. 53, (47), 12735-12740 (2014). de Gennes, P. G. Reptation of a polymer chain in the presence of fixed obstacles. The Journal of Chemical Physics. 55, (2), 572-579 (1971). Slater, G. W., Noolandi, J. New biased reptation model for charged polymers. Physical Review Letters. 55, (15), 1579 (1985). Lilley, D. M. J. Analysis of branched nucleic acid structure using comparative gel electrophoresis. Quarterly Reviews of Biophysics. 41, (1), 1-39 (2008). Pfreundschuh, M., Martinez-Martin, D., Mulvihill, E., Wegmann, S., Muller, D. J. Multiparametric high-resolution imaging of native proteins by force-distance curve-based AFM. Nature Protocols. 9, (5), 1113-1130 (2014).